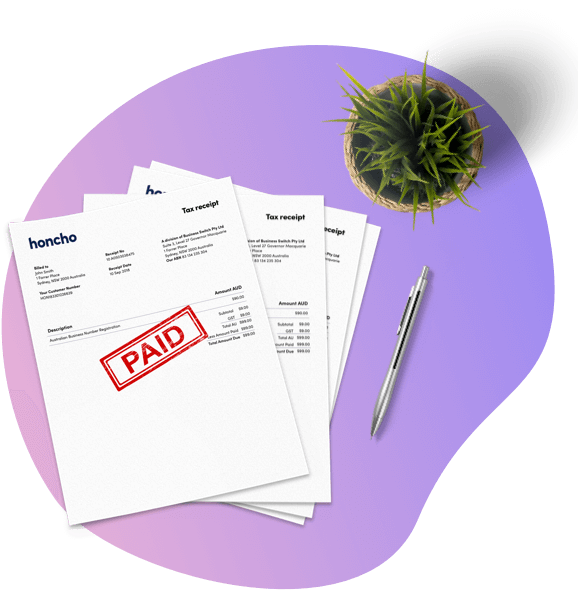 Honcho has made it so easy for you to create powerful and memorable invoices for your business. Our powerful invoices will save you hours of formatting, resizing and editing. So say au revoir to messy paperwork! When it comes to your invoices, we’ll do the maths. All you have to do is fill out the services or products and the job is done! Literally. No more trawling through emails and your recycling bins. With Honcho you can digitally track your invoices and payments. Yep. PDFs are a simple and secure way to distribute invoices and track your audit trail. Send your invoice straight to your customer online, or download your invoice by selecting ‘save & print’ at the bottom of your invoice template page. Can I duplicate my invoices? You sure can! What a time-efficient idea. Instead of selecting “send” at the completion of the invoice, click on the drop-down box and select “duplicate”. Another one of your beautifully branded invoiced will be created. Getting paid by credit card is 3x faster than a traditional bank transfer. Why? It’s super easy for your customer to whip out their credit card, instead of sitting down and typing out your BSB and Account number. Give your customers the opportunity to pay by credit card by activating ‘direct online payments’ via Honcho Pay. What does “Export CSV” mean? CSV, or better known as .csv is a file type (just like .pdf or .doc). CSV lets you export table data between programs such as Microsoft Excel, OpenOffice or Google Sheets. Honcho gives you the opportunity to add CSV into your invoices in order to easily list quotable dates, income and hours. You betcha. Try it out and see what you think. Invoicing is $9 a month. If you opt in to allow your customers to pay your invoices online, there are extra transactional fees. We'll call you shortly to discuss invoicing for your business.